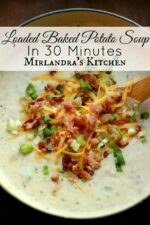 This Loaded Baked Potato Soup is creamy and easy to make on a weeknight in 30 minutes. Everybody loves this hearty winter dish full of bacon. 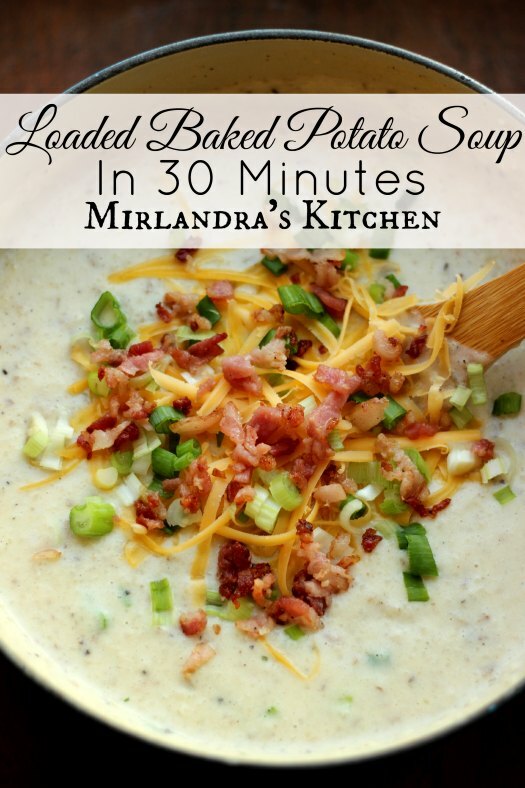 Loaded Baked Potato Soup is one of my happiest college memories. In a stressful world of study and new experiences this delicious soup was a guaranteed pick-me-up on a cold, wet day. I went to college in Corvallis, Oregon. It’s a beautiful town full of gardeners in the heart of the fertile Willamette Valley. I love that valley but it rains so much I’m surprised I didn’t grow moss! I lived on campus at a girls cooperative house for a few years and it was wonderful to walk out of the cold drizzle into a hot, steaming kitchen full of Kevin’s cooking. Kevin was the cook at Azalea House for lunch and dinner on the week days. On the weekends I had the run of a professional sized kitchen and did I ever have some fun!!! But that’s another story. .. The food we ate! Macaroni and cheese, piles of cookies, creamy curry, pesto, BBQ chicken, grilled cheese, ham, breakfast for dinner, meatloaf, garlic mashed potatoes, pizza, gumbo, Irish Chicken Pot Pie, chicken-pineapple quesadillas and, and, and, and! I don’t remember seeing him with a mix ever. If we had salsa, or French bread or gravy he made it himself. I loved most of food Kevin made but Loaded Baked Potato Soup was one of my stand out favorites. I loved to cook and Kevin was always happy to share his knowledge so I spent a lot of time in the kitchen. He was also really great at listening to boy troubles and general day to day crises of girls growing into women. I watched Kevin make Loaded Baked Potato soup a few times. He taught me to use the food processor and to use just a little chicken bouillon for subtle background flavor! That bouillon trick is genius and I have carried it over into so much of my cooking. There really was not a recipe for the way Kevin made the soup. He just put everything together and made magic. I have been making it that way for years but I know some of you will want measurements so they are included in the recipe. I know, I know, you are very welcome! Next time you have leftover baked potatoes (lucky dog) or a cold rainy day toss this together. It’s so easy and it takes less than 30 minutes. The soup is irresistible. 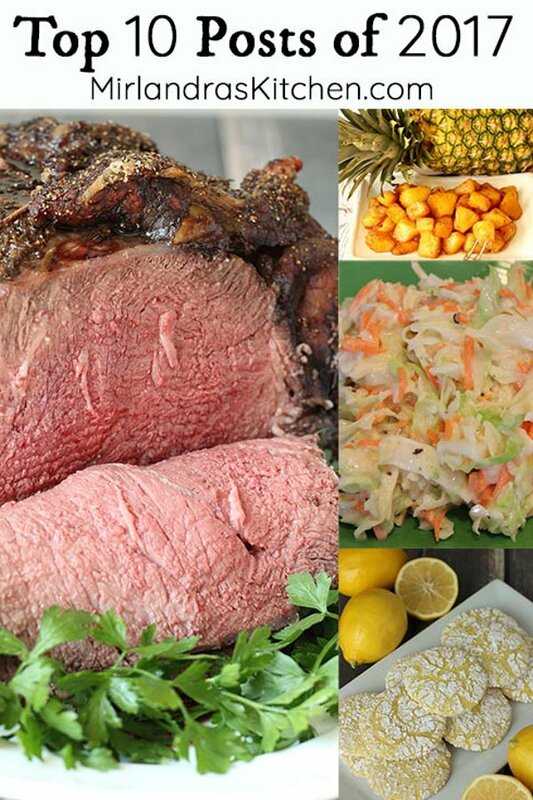 My entire family loves it and I’m sure yours will too! 1 tsp. Johnny's brand seasoning salt or your favorite "season salt"
Chop up the bacon and cook in a cast iron pan over medium heat until crispy. Drain and add to a heavy bottom soup pot or Dutch oven. Use your hands to break the potatoes into chunks. Add to a food processor with 3 cups of the milk. Puree until smooth. Add to the soup pot. Check for large lumps and squish them with your hands or a fork. Add the rest of the milk, the cream, the chicken bouillon, the pepper, the seasoning salt and the 1/3 cup green onions. Bring the soup to a simmer over medium heat and simmer for 15 minutes being careful not to boil hard. Because it's a milk based soup hard boiling can destroy the texture. Garnish as desired with cheese, green onion, steamed broccoli, bacon and sour cream. Leftovers can be heated gently on the stove or in the microwave. If the leftover soup seems to thick heat it first and if you still feel it is thick add a splash of milk to thin it. Cannot find the recipe for your Loaded Baked Potato Soup. Gives the picture and your story of the soup, but no actual recipe and/or what is needed. I’m SO sorry! We made some updates to the page on Friday that did some formatting damage. We have it fixed now and the recipe is visible now in a printable form. Thank you very much for letting me know there was a problem. I hope you enjoy the soup! What is ”Johnny’s Seasoning Salt”, never heard of it & where do I get it, or will any brand of ”seasoned salt” do? Also your directions didn’t say when you add the 1/3 cup of minced green onions to the soup…in the food processor step while pureeing the potatoes with 3 cups of milk or when you add the other cup of milk, cream & seasonings to cook. Your picture looks like there is tiny flecks of green onions in the soup itself that to me looks like it would be added in the beginning step to puree smooth the potatoes & milk since they’re so tiny…not just chopped on top as a garnish. Just thought I’d clarify with you so I don’t make any mistakes as I LOVE potato soup. Good catch on the onions! I went edited the recipe to show that you add them at the same time as the seasoning salt. I cut mine very small with a sharp knife or I mince them in the food processor. If I want to make it “fancy” or some people like more onion than others, I serve additional onion on the side as a garnish for people to add as they like. I hope that helps! I love potato soup too. You reminded me that I should put this on the menu next week! Thanks for stopping by to say hi!